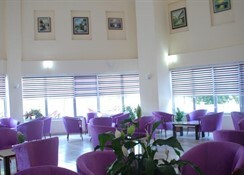 The Side Yesiloz Hotel is a friendly and comfortable hotel set in a fantastic location in Side, Turkey. The beautiful beach is located 1km away from the hotel, where there are a variety of thrilling water sports to enjoy. There is a shuttle bus which runs daily from the hotel to the beach. The resort centre can be found just 2km away from the hotel, where there are a variety of exquisite restaurants, bars, shops, café and nightclubs which carry on until the early hours of the morning for those who enjoy a more vibrant nightlife. Guests who prefer to explore by themselves can jump onto the local Turkish buses, known as a dolmus, for a reasonable price. 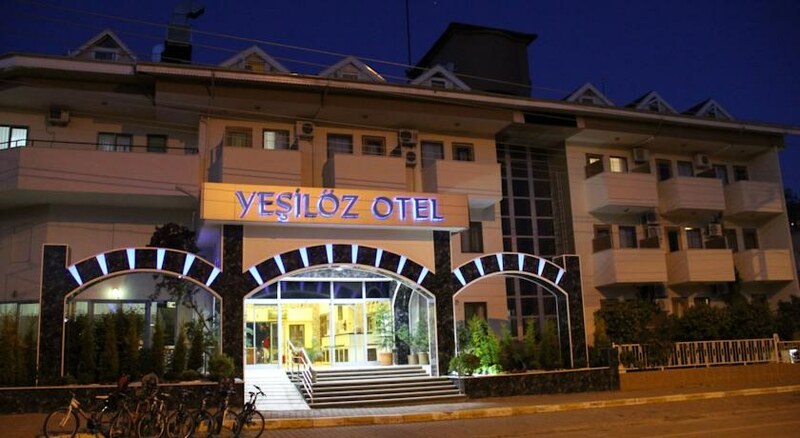 The staff at the hotel are very friendly and will ensure that their guests have a pleasant and comfortable stay whilst at the Side Yesoliz Hotel. 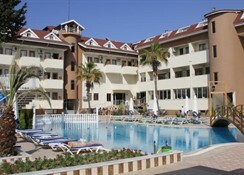 There is a sauna and Turkish bath available to indulge in at the hotel. 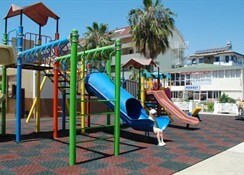 Also there is a children’s play area located on site. Facilities available to guests include reception area, Wi-Fi access, swimming pool, loungers, parasols, sauna, massages, Turkish bath, restaurant and a bar. There is a games room where guests can play table tennis, billiards and air hockey and there''s a children''s playground outside. There is a Turkish Hamam and Spa at the hotel with an indoor pool where guests can treat themselves to massages and beauty treatments. 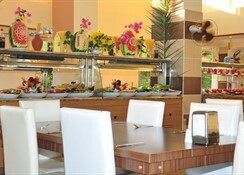 The hotel''s buffet restaurant is open all day and evening and serves international dishes for breakfast, lunch and dinner. In the evening entertainment including shows and dancing is laid on. The hotel has 96 guest rooms in total - 74 standard rooms and 22 family rooms. There are a number of lovely rooms on site. Guests will find that all rooms at the hotel include flat screen Satellite TV, telephone, private bathroom with WC, tea and coffee making facilities, a hairdryer, a safe box and fridge. The hotel also provides sofa beds, extra bedding and cots for infants on request. Certain amenities may be payable locally. 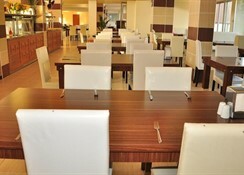 The hotel''s main restaurant serves buffet breakfast, lunch and dinner and features dishes from around the world. There''s also a snack bar. Side Yesiloz Hotel is located approx 1 km from the beach where there are loungers and parasols available to hire as well as watersports to try out. The resort centre is home to a variety of shops, bars, restaurants and nightly entertainment and can be found approx 2 km away. There is a shuttle bus that runs from the hotel to the beach daily. 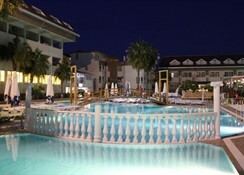 Antalya Airport is approx 66 km from the resort of Side.